A research team led by scientists at Harvard University said it has found a potential new biomarker and drug target for amyotrophic lateral sclerosis (ALS). Published in Nature Neuroscience, the study (“ALS-implicated protein TDP-43 sustains levels of STMN2, a mediator of motor neuron growth and repair”) relied on stem cell models of human motor neurons to reveal the gene STMN2 as a potential therapeutic target. “The findings that ALS patients almost universally display pathological mislocalization of the RNA-binding protein TDP-43 and that mutations in its gene cause familial ALS have nominated altered RNA metabolism as a disease mechanism. However, the RNAs regulated by TDP-43 in motor neurons and their connection to neuropathy remain to be identified. Here we report transcripts whose abundances in human motor neurons are sensitive to TDP-43 depletion. Notably, expression of STMN2, which encodes a microtubule regulator, declined after TDP-43 knockdown and TDP-43 mislocalization as well as in patient-specific motor neurons and postmortem patient spinal cord,” wrote the investigators. Two ALS drugs have been approved by the FDA, but they act only to slow the disease. In addition to a cure, or even a treatment that is effective for more ALS patients, an effective test for ALS is needed, said the researchers, and that depends on a reliable biomarker. Some of the genes at work in the proteasome were interacting with TDP-43 in a way that led to ALS. But which genes are involved, and what they are doing, has not been known. TDP-43 is one of many proteins that binds to RNA. The researchers set out to identify, for the first time, all the possible types of RNA that are regulated by the TDP-43 protein in the context of human neurons. Then, they looked at what happened to each gene when they manipulated TDP-43. Until now, studies like this have only been carried out in mice and cancer cell lines. 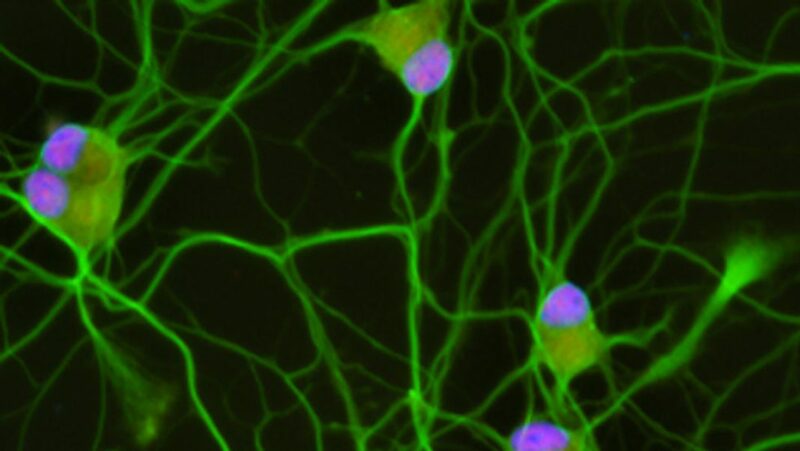 “Once we had a connection between the TDP-43 and the loss of this other critical gene, STMN2, we could see how a motor neuron might begin to fail in ALS,” said Joseph Klim, PhD, postdoctoral fellow in the Harvard department of stem cell and regenerative biology (HSCRB). “With the discovery that our human stem cell model had predicted exactly what was happening in patients, Joe went on to test in this system whether fixing Stathmin2 could rescue the motor neuron degeneration in our dish caused by disturbing TDP-43. In a beautiful series of experiments that I believe provide great hope for patients, he went on to show this was exactly the case: rescuing expression of Stathmin2 rescued motor neuron growth,” added Kevin Eggan, PhD, professor of stem cell and regenerative biology at Harvard. The researchers observed that without TDP-43, STMN2’s protein-making instructions turn into nonsense. The next step was to see if their findings reflected the reality of a patient’s biology. They obtained data from RNA sequencing studies that used post-mortem samples from ALS patients. Those datasets, compared with controls, echoed the team’s original findings in human stem cell models. The data from ALS-patient spinal cords mapped to the cryptic exon, but data from the controls did not.